Why did C-3PO close down while Luke talked to Ben in A New Hope? THREEPIO: Sir, if you'll not be needing me, I'll close down for awhile. Why did he want to do that? The Star Wars in 100 Scenes factbook confirms that his request to shut down was guided by it aiding his mechanical systems in repairing his damaged arm. The official Alan Dean Foster George Lucas novelisation of 'Star Wars: A New Hope' backs this up and gives us some additional dialogue that didn't appear in the film. “Sir?” came a familiar voice Luke hadn’t heard in a while. “What?” Luke was startled out of his examination. I've always seen it as a (rather transparent) way of taking Threepio 'off the stage' so to speak, so that the viewer can concentrate on the dialogue between Luke and Ben without distraction. This is clearly a major scene in the series, after all. So I doubt that there is a canon explanation because it's part of the filmmaking machinery. Threepio shook his head slowly. "Quite frankly, sir, I don't know what he is talking about. Our last master was Captain Colton. I've never heard Artoo mention a prior master. I've certainly never heard of an Obi-Wan Kenobi. But with all we've been through", he concluded apologetically, "I'm afraid his logic circuits have gotten a bit scrambled. He's become decidedly eccentric at times." And while Luke considered this turn of events, Threepio took the opportunity to throw Artoo a furious look of warning. (src: "Star Wars: ANH novelization", after Luke first sees Leia's hologram). This last statement is very out of place, unless C-3PO did not want Luke to know the full story (possibly on orders from Bail Organa) yet. So, knowing that he's a complete and utter blabbermouth otherwise, he shut down so as to not spill any secrets while Ben Kenobi talked about Anakin Skywalker. There's no canon support for this, but it's one of the few explanations that makes sense, since we don't see any 0BBY era droids needing to shut down for some strange reason otherwise. I too am puzzled as to why 3PO feels the need to close down during the scene with Luke and Ben, the only reason I can see is it has something to do with the light saber being used in the shot, which passes in front of 3PO, it may have been easier for the FX guys if 3PO was stationary at the time of the effects being used, so not having reflections etc to deal with. Just a theory not sure if this is right. Craig. He powered down, as he was tired. Can droids be shut down manually? 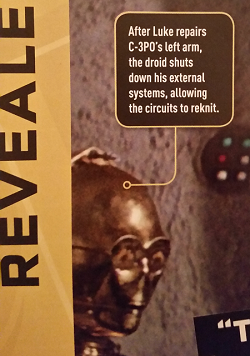 Does the “Star Wars” book C-3PO have a malleable face? Why would a protocol droid act so nervous? Why did Poe and Finn's TIE Fighter land so close to the scavenger town? Why would C-3PO consider the Millennium Falcon to be old?